Are you looking for something different to do with your kids this summer, but still want them to be active? If so, laser tag is the perfect activity for you. Children and adults can play together, running through creatively decorated facilities that make you feel as if you’re in a completely different time. My husband and I took our niece and nephews to play laser tag, and I’m not sure who had more fun, us or them! Here are just a few local options that can provide a couple of hours, or a whole day of entertainment! Laser tag is also a great place for a birthday party for kids. With over 12,000 square feet of futuristic-themed laser tag space, X-Site offers an exciting experience with radio-based tag equipment utilizing real-time scoring. It serves food items such as salads, subs, and pizza from Marco’s Pizza, and has an arcade space, as well. Be sure to check their website for group and birthday party coupons, as well as for their daily specials, including details about a family night deal and unlimited laser tag. Located inside the Expo Bowing Center, children and adults play in a futuristic arena. Each game is approximately 15 minutes long, and players seek to deactivate opposing team members. Be sure to make reservations on Saturdays and Sundays, as they are now required. They offer several birthday party options, as well, including a laser tag and bowling package. 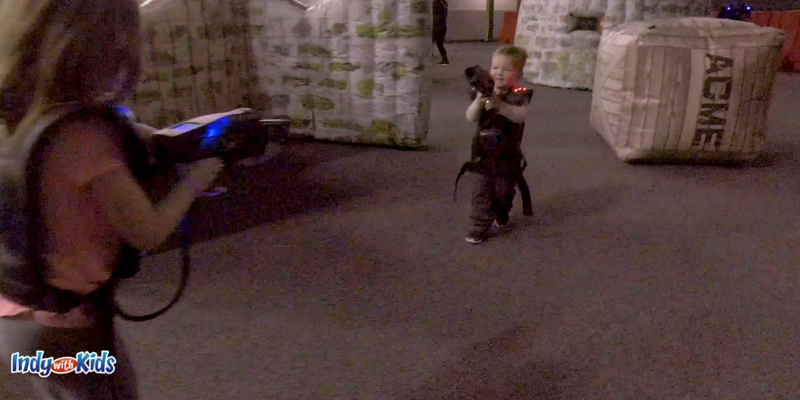 Run around and play with your friends in this 4,000 square foot, multi-level laser tag arena on Indy’s west side. If you’re looking for laser tag in Hendricks county, look no further. This Thursday – Sunday venue has 20 minute game sessions. Purchase one session or receive a discount when purchasing multiple sessions. Specials are available on their website, including $20 unlimited laser tag deals on specific days. This 7,800 square foot facility can accommodate up to 42 players with up to 4 different teams. They utilize radio based gaming equipment, with real time scoring. Noble Roman’s Pizza is baked fresh onsite, and is equipped with 39 arcade games for additional entertainment. A party room and specials are offered, as well. Reservations are strongly recommended. The historically paintball only site, and home of Necropolis Haunted House in October, Dark Armies now offers laser tag. Laser tag sessions are 90 minutes long, and are limited to 10 players per session. Reservations are highly recommended. Incrediplex near Lawrence on the east side, offers laser tag and many other activities to keep kids, teens and their parents amused. Try the multi-level climber and bounce houses, spend some time on the huge variety of arcade games, bowl a quick game, play on the sports fields or get busy in the laser tag arena. Team laser tag or everyone for themselves games are available. Purchase single games and watch the Incrediplex website for specials. Incrediplex is a favorite Indianapolis birthday party venue for children, teens and pre-teens…and their parents. This bowling alley, arcade, laser tag fun center has a lot to offer for Indianapolis birthday parties and family fun. Laser tag is one of the many amusement options offered. Pay per game or grab a Pick Your Play pass for unlimited fun. This is one of our favorite places to play indoors on a rainy day or when we just need a special treat activity. The multi-level arena is especially great for school aged kids and pre-teens. 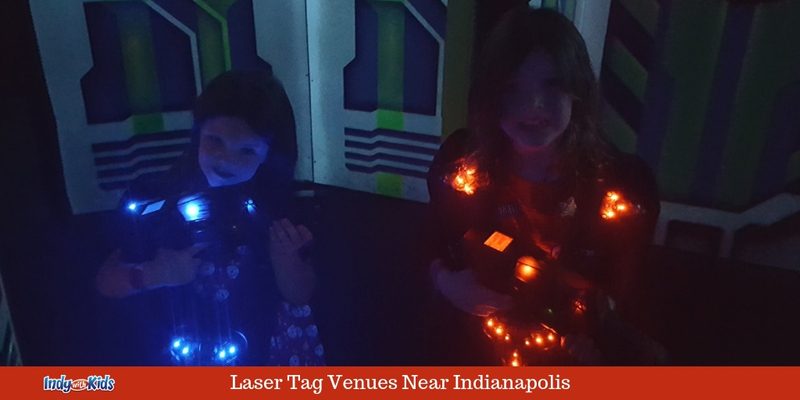 Younger kiddos can especially appreciate the laser tag arena at Zip City in Indianapolis. The playing field is situated under the zip-lines in a fully lit area. The dark, black light atmosphere is not a part of the laser tag at Zip City. My kids all have a really great time playing together and it doesn’t feel scary or cause anxiety at all. We’ve attended many birthday and school parties at Zip City and we never tire of the endless attractions available for many ages.